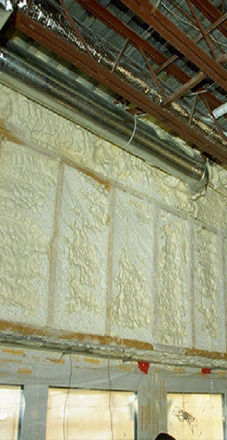 EarthSeal 170 is the most technologically advanced bio-renewable closed-cell spray foam insulation system in the world with vastly superior performance in the areas of fire-resistance and bio-renewable content. EarthSeal 170 is the only non-processed polyol spray foam system in the world making it the healthiest and most environmentally friendly closed-cell foam in history. It is designed for application to interior sidewalls at substrate temperatures as low as 20°F (2°C). EarthSeal 170 is available in three reactivity variations to accommodate a broad range of surface temperatures and ambient conditions. When installed in the walls and roof system of a building EarthSeal 170 adds significant structural strength to the building while it improves comfort, indoor air quality, and reduces energy consumption by up to 60%. As it seals the building envelope it stops the infiltration of moisture-laden air eliminating problems associated with moisture and condensation such as structural damage, rot, mold and mildew. EarthSeal 170 should covered with coating when used in exterior applications as the sunlight will rapidly degrade the product. Applicable codes must be strictly adhered to. Must be covered by an approved 15 minute thermal barrier.